Today is the day that not only can I call myself a blogger, designer, cad monkey and photographer... but I can also call myself a Freelance Writer!! Um, WOW! 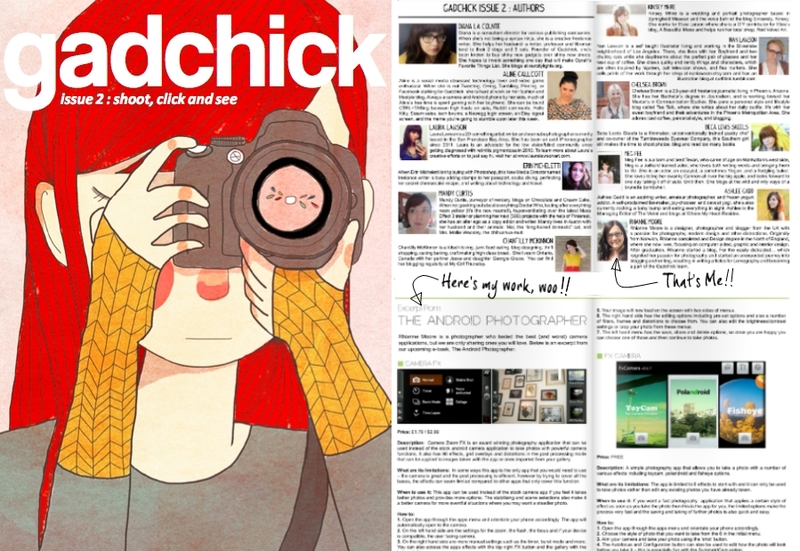 I've written a short post for Gadchick before, but recently Diana contacted me about writing a Gadchick Ebook for Android Photographers, testing and reviewing a variety of Android apps, and Gadchick Issue 2 contains an excerpt of that Ebook, the Ebook that I wrote, haha!! check it out, you won't be disappointed!! I'd like to quickly thank Diana, Aline and Scott from Gadchick for thinking of me to do this and believing in me, I never imagined when I started blogging that this would ever be something that I would do (um, I wrote an ebook...) or that I would be part of such a great team. I am tickled (hello kitty) pink!! p.s. Dear android photographers, the ebook isn't available quite yet, but it will be soon and of course I'll let you know when it is. There are some pretty amazing apps available on Android at the moment and the book also contains tips from me, so it will be worth the wait, I promise.